Bunjevac empathises with the displaced, having been born in Welland, Canada, in 1973 but raised and educated in Yugoslavia, only to return to Canada at age sixteen to continue her art training, a year or two before the outbreak of the Third Balkan War. After graduating and rejecting her photorealist oil painting as too static and bourgeois, she turned to sculptural installation, discovering its narrative potential. 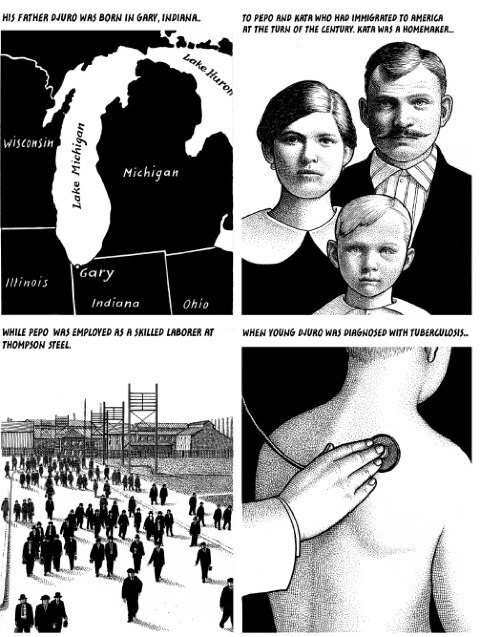 In 2004, inspired by the pointillist precision of New York caricaturist Drew Friedman, she began drawing comics. These became, she says, “the last nail in the coffin of my marriage”. 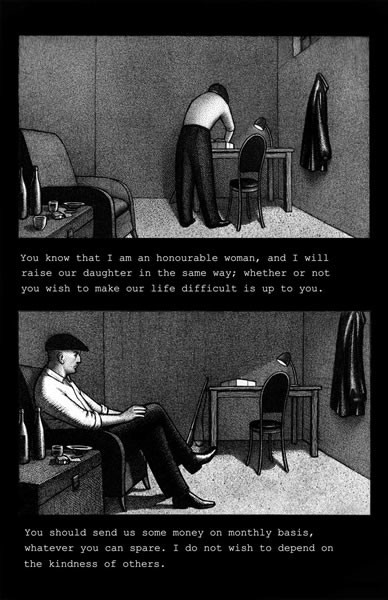 As a single mother in Toronto, juggling two jobs and raising her son took priority, but Bunjevac pursued comics, participating in the vibrant underground scenes in the Balkans, North America and elsewhere. Comics have become where she belongs. Exhibited at Belgrade’s Centre for Cultural Decontamination and published in Serbia in late 2011 by Omnibus in Belgrade, this powerful piece stirred up mixed reactions, “ranging from high praise to mockery, mainly due to my political views”. ‘August 1977’ soon spread to Croatia, where Bosnian writer Miljenko Jergović hailed it as ‘unique to all post-war literature in the region’ and compared it to the writings of Thomas Mann. Tell me about the genesis of your story about your father’s death. The story “August 1977” was originally published as “August 1976”, as I got the dates of my father’s death mixed up. 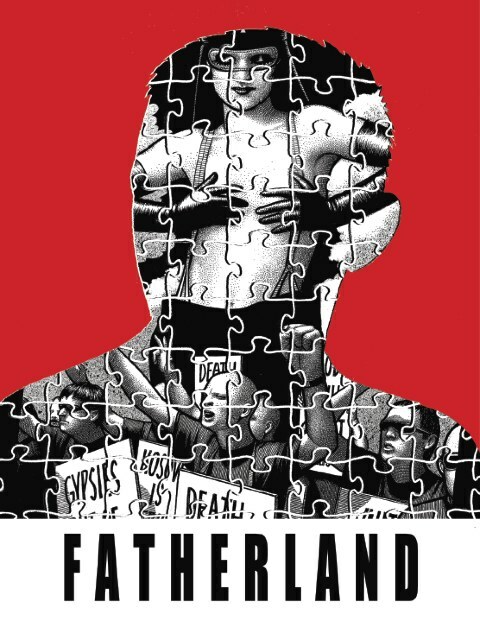 It was created as a symbolic recreation of the last three hours of his life and as an attempt to reject my father’s ideology, and the patriarch itself. I began working on it after my trip to Serbia in 2009 when I learned of humanitarian crisis in Serbia, especially in the context of the rise of the neo-fascist groups, attacks against the Roma minority and the Belgrade Pride fiasco (the 2005 Queer Belgrade bloodshed, public threats aimed at the LGBT community). In 2011 I was invited by the Novo Doba comics festival in Belgrade to participate and exhibit “August 1976” (now August 1977). My exhibit took place at the Centre for Cultural Decontamination. What was the reaction to this story when it was published in Serbia? 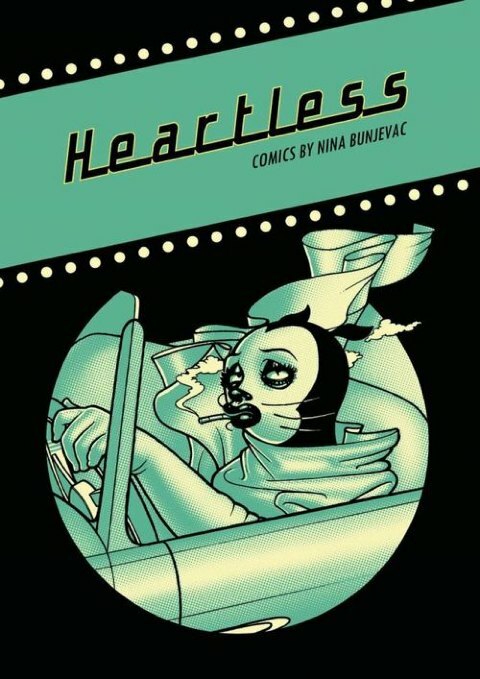 When Heartless, my collection of comics, came out in Serbia in December of 2011, it created a stir in the comics community; much was written about it, with comments ranging from high praise to mockery, mainly due to my political views. However, the opinion of those whom I hold in high regard were very positive. After a review written by Miljenko Jergovic in the Croatian Morning Paper came out, calling the story “unique to all post war literature in the region”, and comparing my work to Thomas Mann, my work became known to Croatian public, in broader sense. Petra Jurlina of the Centre for Peace Studies read the review, and extended an invitation to attend a five day educational and peace-building event in Croatia. The event was held at the Jankovic Castle in Islam Grcki, near Zadar. The Jankovic castle is located on the historical line between the Ottoman empire and the Christian world. It was built by Jankovic Stojan in the 17th century in order to keep the Turks away from Venice and the Austrians. The region itself was divided between the orthodox Christians and the Catholics, and was heavily damaged in the last war; the castle was burned down as well. However, the Croatian Ministry of Culture has given the castle back to its rightful owners, the Desnica family, and started the initiative of rebuilding it. In short, the castle was a perfect and symbolic place to begin rebuilding peace between different ethnic groups in this region. Who took part with you in this event? The participants (or most of us, writers, poets, visual artists, activists)) came from all former Yugoslav republics and have moved to different countries (or escaped in most cases), Norway, Canada, Austria, Germany…. Put us all together under the same roof and what you get is tears and laughter and nostalgia you could cut with a knife. On the fourth night of the event my story “August 1977” was exhibited, I gave a talk, and gave away all original drawings to key participants, or all those who were exiled. Can you tell me about your influences and how you came to choose to make your own comics? Upon graduating from the Ontario College of Art I began painting with oil until I hit a dead end. The medium of painting I found to be too static, and bourgeois. I soon turned to sculpture installation, discovering its potential for the narrative. 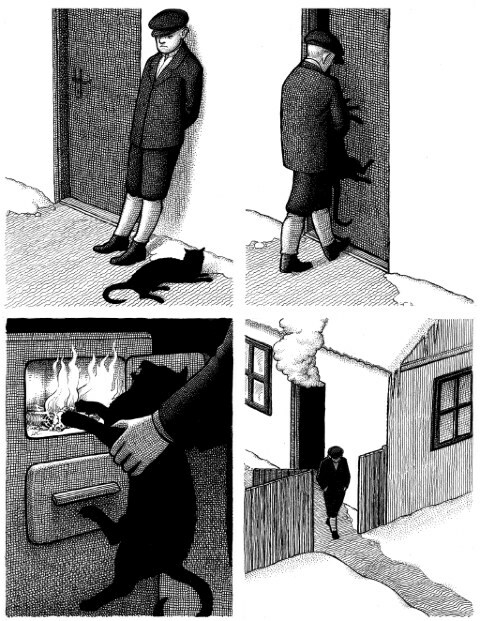 In 2004 I began drawing comics, as a hobby at first. 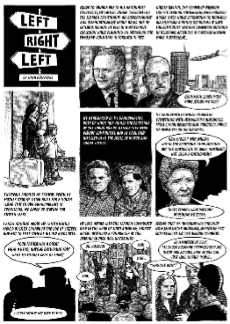 Having been encouraged by my writer friends to take comics seriously, I had a strip published in a local magazine for zine art and independent culture, The Broken Pencil. I also got the first writing grant through the publisher. I guess it is safe to say that tuning to comics was the last nail in the coffin of my marriage. As the marriage was beginning to disintegrate, my comics took the back seat. Over the next few years I struggled to make ends meet, often working several jobs in order to support myself and my son. Nevertheless, I continued to create comics in between two jobs and other obligations. Connecting to Zograf in Serbia was an important step for you. Yes, it was in 2007, while guest-editing an issue of the Toronto-based comics magazine DTM, that I connected with Aleksandar Zograf, who invited me to Serbia, and organized a showing of my work. The reaction of the Serbian comics scene to my work was very positive, and as such, provided a much needed boost to my motivation. I also connected with the Croatian scene, and Komikaze to be precise, and the Italian underground through the CRACK festival which is held in Rome every June, organized by Valerio Bindi, MP5 and Guicy Noce (to name a few) at the Forte Prenestrino. The scene at CRACK was politically charged to a point, and I even found myself interviewed on the Onda Rossa radio station, speaking about the humanitarian crisis in the Balkans, particularly the state of the Roma minority in Kosovo. Upon returning to Toronto from Rome in 2010, I began working on the new book, in the form of a script at first, and quit my job at the animation college to dedicate my time solely to creation of comics. Putting together a collection of my previous comics, Heartless, took a lot of my time, so the new book, in the meantime, had to wait. I am glad it had to wait though, because the script itself took many different forms, and had been written and re-written about dozen times. At first I wanted to do a graphic novel, mentioning every single crime against humanity on the territory of former Yugoslavia but, eventually, or particularly after my trip to Croatia this month, I decided to change the contents and the format once again. How has your new graphic novel project changed? I decided not to write about things I have not experienced, but those I have, and include a positive conclusion, such as the peace-building initiatives that need to be mentioned. The book will be of the same format as Heartless, done in short story increments, with each focusing on a different family member. The final one will be my own, describing how I came to create “August 1977”, my trip to Serbia to the Centre for Cultural Decontamination, and to Croatia. The world does not need to be reminded of the evil deeds, particularly the new generation. Reconciliation needs to be brought upon the same generation responsible for terrible things that have happened in the nineties, but peace-building is something that is up to the new generation; the same generation that is more likely to read comics. I understand the Balkan mentality very well; people of this region do not respond well to accusations, or finger-pointing, but do respond well to humor, and making peace. As for the format of my new book, I must say that the major influence was David Sedaris. This man has told some pretty heavy stories disguised through humour and wit. I found myself reading some of his work, laughing at first, crying at the end. People just don’t have that kind of time to dedicate to novels, we live in a fast-paced world, and that is a sad fact. I strongly believe that the short story format is bound to save the literary world from collapse. Thanks Nina. 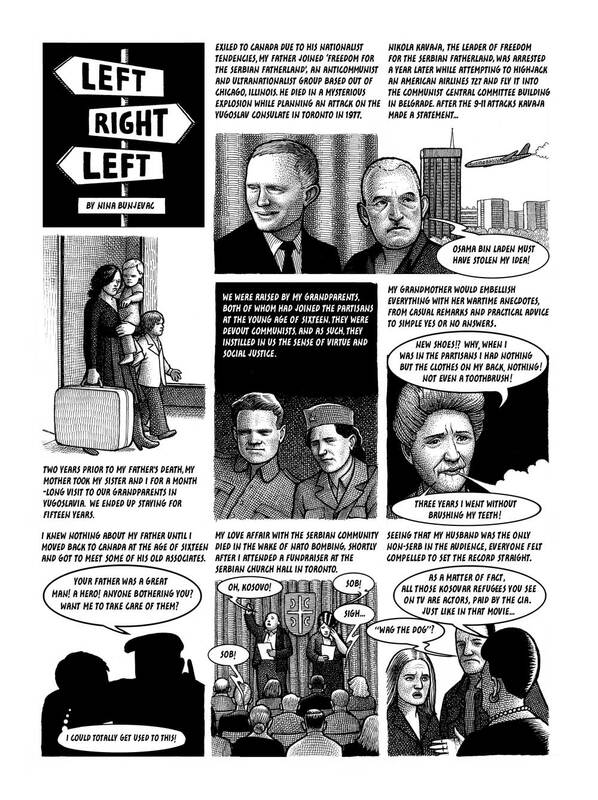 Read her short graphic story for ArtReview magazine below. This Article originally appeared in the November 2012 issue of ArtReview Magazine. Photo of Nina Bunjevac © Luca Donnini.